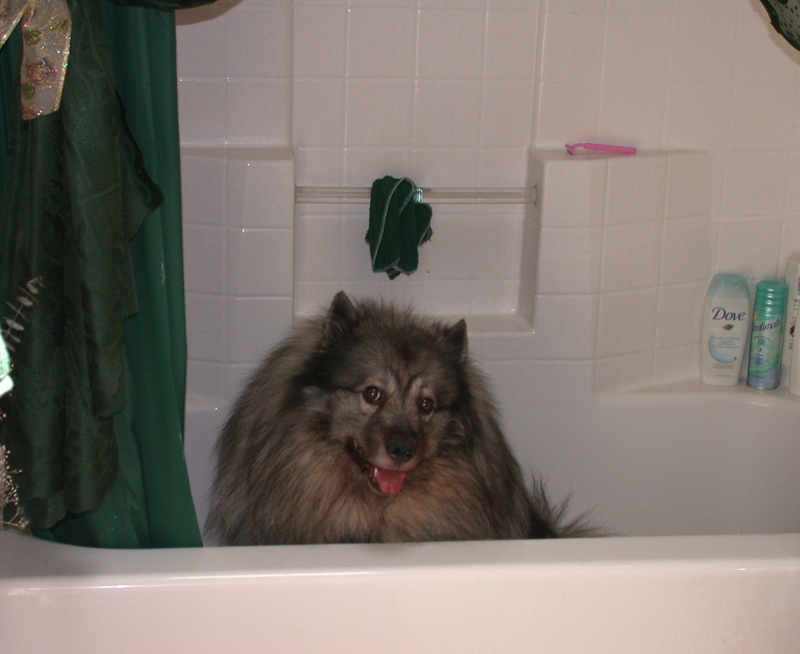 On June 26th, 2006 my beloved baby BooBoo a healthy 80 pound, five year three week old Keeshond died due to heat related illness. After a necropsy we can only conclude water intoxication. He always drank a lot of water but he got David up in the middle of the night. He only drank two bowls of water but that was enought to cost him his life. At 4:00 AM it was still 85 degrees. I put ice on his head and femerol artery. I put him in the tub and showered him off. Getting out of the tub he had a siesure. Before I could get him in the car he was gone. This page is to call attention to our animal family and their special heat related needs. I believe too many animals are put down because of the cost of adoption. We all know people live longer and happier with pets. Seniors and the disabled are often unable to justify or afford the cost of adoption. Often after a beloved pet dies they sit alone waiting for their time. Please sponsor a senior or a disabled person by helping them adopt a pet or make a donation to your local ASPCA. It’s heard to think about you right now . . .
the pain of your loss as great as the love. I see your sweet face in every room we shared. In my mind I still see you there. filled only with the screams in my mind. With no warning you slipped silently into the night. Only five years old, it wasn’t right. The love you gave, the joy filled each and everyday. Sweet kisses – puppy milk breath soon gave way to adult love. A homely little puppy face grew into the majesty of a full grown dog. You were bigger than they said you would be. Eighty pounds instead of forty. Your size frightened some but your big heart melted the most frigid heart. As big and beautiful as you were your heart, soul and spirit were even more. Your love, big enough to patch a hole left by another loss. Each day my love for you grew. Footprints in the mud now hardened and dry. stains on the carpet that I can’t bare to clean. Mementos- all I have left. the pain your loss would bring? just one day of love from you was worth it all. How can I thank you for the five years you gave? More of a child than a dog, I have lost my best friend. Things I did not see? Was it a sign of something else? Or was the heat just more than your little body could bear? The vet said nothing was wrong. She told me I did all anyone could. I simply did no good. I should not blame myself or so they say. Who then should I blame? A God I can no longer believe in? Like a super nova you burned bright. Only to flicker and burn out long before your time. I will miss you my BooBoo Bear. Dedicated to the seniors whose only companion is their pets and to my beloved BooBoo. No flowers left on the doorstep. No cards to ease my pain. I sit alone in my room waiting. Waiting for the day we will be together again. While I stare waiting for the phone to ring. It’s like I lost my child, the pain the same in the end. I could do it to me, but I could not leave you. And then my heart would sing again. My best friend, always by my side. Then suddenly in the night you died. Abandoning you for their own life. But a dog will never leave you. Even if you don’t treat him right.